Former Gov. Pat Quinn was in Austin Wednesday seeking signatures from local residents for his referendum ballot proposal that would limit Chicago’s mayor to serving two terms. 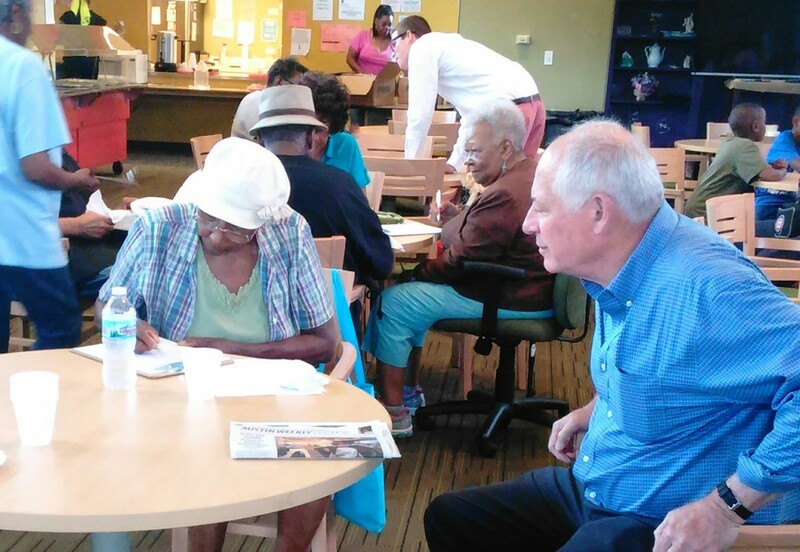 Quinn spoke with elders and community residents at the Austin Senior Satellite Center, 5071 W. Congress Parkway. South Austin Coalition Community Council (SACCC) joined Quinn and is fully behind his effort, said SACCC’s Lillian Drummond and Bob Vondrasek. To ensure success, Quinn aims to collect 100,000 signatures, more than half of what’s needed to get the binding referendum on the 2018 ballot, one year before the next mayoral contest. Mayor Rahm Emanuel’s stint in office is a driving force behind the push for term limits. “These mayors think they’re there forever,” Quinn said to about three dozen people at SACCC’s regular monthly meeting. Quinn, a longtime Galewood resident, signed up about two dozen people at the meting, adding to the roughly 3,000 signatures he said he has collected since launching his effort last month. Under the proposal, Chicago’s mayor would be limited to two four-year terms. Other major U.S. cities, including New York, Houston and Los Angeles, have mayoral term limits. In Illinois, Springfield, Lombard and Naperville are among the cities with term limits, Quinn said. “There’s only one big city that doesn’t have term limits on the mayor, and we’re right here in Chicago,” said Quinn, who took sharp aim at Emanuel’s 2016 budget, which included a property tax hike and garbage collection fee approved last year. Quinn is also pursuing another referendum, this one to create a “consumer advocate” elected position in Chicago, replacing the City Hall-appointed post by the mayor. “Right now we have a department that nobody hardly hears about. We want to make sure we have a strong advocate for everyday people when it comes to taking on big corporations,” Quinn said. Austin state Rep. La Shawn Ford, who joined Quinn at the senior center, said he’s back the term limit referendum initiative. Ford proposed legislation last December to recall the mayor over his handling of the Laquan McDonald police shooting case, which included signing off on a $5 million settlement to the teen’s family in April 2015, shortly after the mayoral run-off election that Emanuel narrowly won. The Chicago City Council quietly approved the settlement as the McDonald shooting video was kept from the public. It was not made public until November 2015 when a judge ordered its release. “It’s clear to me that we can’t have another term with this administration,” said Ford, whose recall bill has stalled in the Illinois General Assembly. Quinn’s recent referendum campaign is a return to his shake-up-the-establishment grassroots activism. In the early 1980s, he led efforts to create the watchdog Citizens Utility Board and passage of a state constitutional amendment to reduce the Illinois House of Representatives from 177 members to 118. In the 1970s, Quinn succeeded in getting a referendum on the ballot that stopped state lawmakers from receiving their entire year’s salary in one lump sum payment, a practice that dated back nearly a century. Quinn has been mostly out of the limelight after narrowly losing the governship to Bruce Rauner in 2014. Ford noted that Quinn retained his independence even while in elected office, including stints as state treasurer (1990-1994) and lieutenant governor (2002-2008). The former governor is optimistic there’s enough support to get a term limit ballot measure approved.